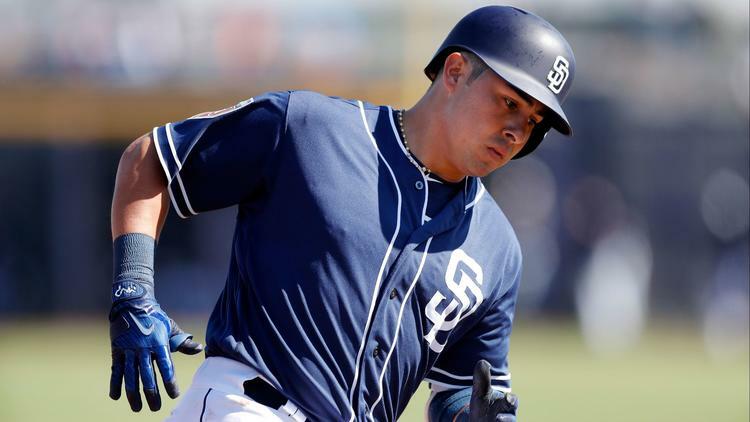 With Wil Myers playing everyday at third base, what is the future for Christian Villanueva. He certainly put up decent numbers in his first season in the major leagues, but is he part of the teams plans for 2019 and beyond? The San Diego Padres had some uncertainties to start the season at third base. During the offseason, Padres general manager A.J. Preller acquired third baseman Chase Headley and Bryan Mitchell from the New York Yankees for outfielder Jabari Blash. While the centerpiece of the trade was Mitchell, the 34-year-old Headley was shaping up to be a stop-gap option for the Padres at third base as it was all but assured that he would be the opening day starter at the position. Headley was, to put it nicely, downright awful with the Padres. His reputation as being an average hitter with a consistent ability to get on base is what gave the Padres hope that Headley would provide a positive impact on the field. Instead, he posted a negative WAR, didn’t hit above .120 and his on-base percentage was a mere .233. Headley was released by the Padres and is still currently a free agent. 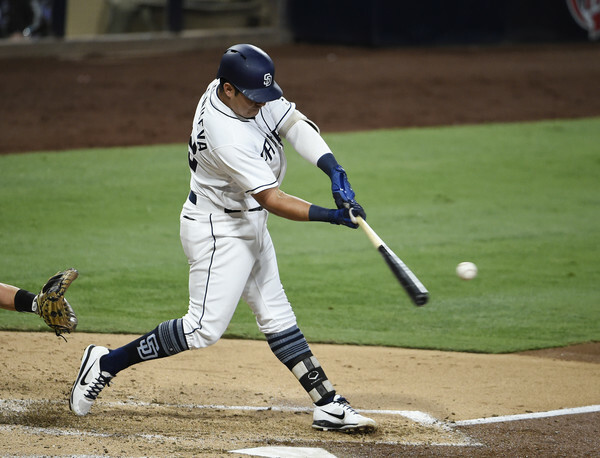 Luckily for the Padres a 26-year-old rookie from Guadalajara, Mexico was ready to step up and fill the shoes left by the disappointing veteran. 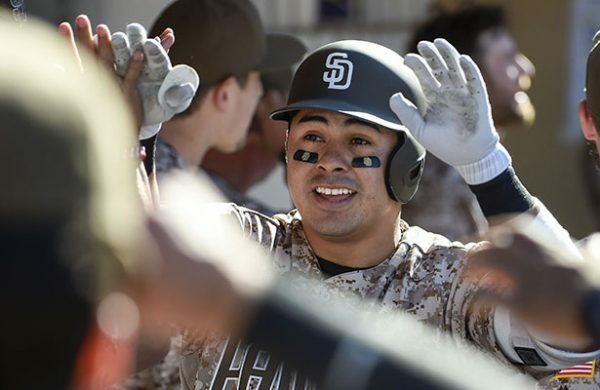 Christian Villanueva, who many believed should have started the season as the Padre’s third baseman, was thrust into an everyday role. Villanueva thrived, earning Rookie of the Month honors in April and putting his name into serious contention for Rookie of the Year to start the season. While his “claim to fame” didn’t really lost lang, Villanueva put together a relatively decent season before breaking his middle finger that would ultimately end his season. In 351 at-bats this season, the rookie third baseman hit 20 home runs, drove in 46 runs, posted a .236/.299/.450 batting line and also had a 1.7 WAR. He was especially lethal against left-handed pitching, blasting 14 home runs and posting a .336/.392/.726 batting line against lefties alone. Defensively speaking, Villanueva has been below-average at the hot corner and his errors have proved costly at times for the team. 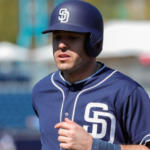 The Padres have experimented with him at shortstop, second base, and first base throughout the season and hope that Villanueva can provide them with some versatility in the long run. Unfortunately for Villanueva, the Padres seem to be exploring their options at third base for the future. Prior to his injury, the team elected to try Wil Myers, normally an outfielder, at third base. While Myers has had his ups and downs since the transition, he’s clearly still learning how to play the hot corner and many believe he has the talent to stick around their long term. With Myers on a pretty hefty contract, and the Padres unlikely to move him, there simply may not even be an opportunity for Villanueva to play third base long term. Even with Wil Myers at third base, rumors have been surfacing that the Padres may be looking to make a move for an “impact” player at the hot corner in the offseason. Obviously, the possibility of signing Manny Machado in free agency exists, it is highly unlikely that the Padres even meet his gargantuan asking price and that Machado chooses to sign with a non-playoff contender this offseason. Stepping away from Machado, the Padres could explore the possibility of signing a cheaper option to man the hot corner for them. Players like Mike Moustakas and Eduardo Escobar come to mind, as both are average to above-average players that should not command extremely lucrative deals. If the Padres are unable to sign someone throughout free agency, they could always attempt to trade for any available third baseman on the market. Bringing anyone in would immediately result in an extreme loss of playing time for Christian Villanueva as the team would probably deem him unfit to be their long-term option at third base. The Padres could also dip into their extremely talented farm system and hope that one of their third base prospects is the long-term option at third base. The obvious candidate would be Fernando Tatis Jr., the clubs number one overall prospect, but scouts believe Tatis can play shortstop long term and will stick there. Next on the list would be Hudson Potts, a 19-year-old who burst onto the scene this season. Drafted in the first round of the 2016 MLB draft, Potts blasted 19 home runs and drove in 63 runs this season. He also posted a .260/.335/455 batting line in 484 at-bats this season for both High-A Lake Elsinore and Double-A San Antonio. 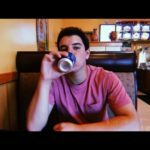 Potts has raw power and has the potential to be an everyday third baseman according to some scouts if he can improve his approach at the plate and play consistently good defense. Potts is still very young, however, and the Padres won’t ruin his development by rushing him to the big league level. This scenario, along with Wil Myers moving back to the outfield, would ultimately be Villanueva’s best bet to secure himself playing time next season as he would just be a stop gap until Potts, or another prospect, is ready. Unfortunately for Christian Villanueva, it appears that he doesn’t really have a long-term role secured with the team. The Padres seem to think Wil Myers could play third base for them in the long run and would only transition him back to an outfielders role if they brought someone in via free agency or a trade. Villanueva does have something going for him, however: he absolutely mashes left-handed pitching. The Padres may just keep him around as a utility infielder that can be used as a pinch hitter against lefties or even make an occasional spot start here and there. Christian Villanueva’s start to the season was surely an exciting one, but unfortunately for the 26-year-old, his future with the Padres seems to be a cloudy one at best. If Villanueva has value in a trade that is the direction they should go. That’s a lot of youth. On a team like this, Jankowski would be considered to be an old sage. The oldest guy here is Hosmer, who will be 29 for the entire 2019 season. Well, he would turn 30 during the World Series. He clearly has value. He had a 1.7 WAR, which projected to about 2.5. How many Padres can claim that? CV has shown demonstrably that he is a platoon player. Period. Keep him on the bench as a RH power threat, and start him only against lefties. No one who hits righties as poorly as he does (.189/.255/.319 in 238 AB’s) has any business playing every day. Plus, he’s already 27, so this is pretty much what you’re going to get. If the NL adopts the DH rule, keep him around; that’s 250-300 AB’s a year of good production. Yep, bench player. One hot month means nothing. If SD has the guts for it they should have Villanueva play 3b and Myers at 1b against LH pitching, with Myers at 3b and Hosmer at 1b against RH pitching. If nothing else this might make Hosmer choose to waive his no-trade clause and allow them to bad-contract-swap and undo this foolish signing. Exactly what I would suggest. Hosmer has pretty terrible splits against lefties this season.